In the coming years, our nation will face myriad challenges related to the care of the growing number of aging Americans. Elder care encompasses many things, from health care to retirement security to the mental, physical, and financial costs of caring for those who cared for us. Current policies and practices for tending to the needs of elders are expensive, haphazard, and emotionally challenging. There is a great need for policies that help Americans care for their aging loved ones, and these policies must reflect real family values, including fully embracing the shared responsibility of ensuring that older Americans can age with dignity, fairness, and respect. At the same time, the decisions that elders and their families will—and, often, must—make in order to guarantee the dignity and safety of loved ones are as much values-based and emotionally laden choices as they are economic or financial necessities. Local communities and communities of faith throughout the country are meeting the challenges facing an aging population and those who care for them in both traditional and innovative ways. Caring for those who cared for us can be both an emotionally and economically demanding experience, yet it is one that millions of Americans take on without hesitation. There were an estimated 46.2 million people in the United States over age 65 in 2014. Furthermore, 39.7 million people—16 percent of Americans over the age of 15—provide daily, unpaid care for at least one elder. The paid elder care workforce is growing as well: In 2014, 799,080 people worked as home health aides, an occupation that is growing much faster than other jobs and that is predicted to increase by 48 percent by 2022. The Center for American Progress’ Faith and Progressive Policy Initiative believes that economic policies must address the needs of each group involved in the care of the aging—elders, their families and family caregivers, and the paid elder care workforce—as well as live up to the values that strengthen families. Recognizing and respecting the dignity of all work, embracing the responsibility to family, and caring for the most vulnerable citizens are values that must inform the United States’ approach to elder care. To do this, it is necessary to define, frame, and understand the current elder care landscape, as well as its intersections with economic policies that reflect real family values. In the coming years, the elderly population in the United States will grow rapidly. America’s elderly will face unique economic challenges that must be met with policies that ensure dignity and help individuals accept and shoulder responsibility—in short, honor real family values. As the Baby Boom generation—those born between 1946 and 1964—ages, the elder population is projected to double to 88 million people by 2050. Looking forward, policymakers will have to consider the ability of older Americans to support themselves and meet the financial burden of their care needs. Those over age 65 are currently the least likely age cohort to be living in poverty, thanks in large part to Social Security and other programs such as Medicaid, which are generally attributed with lifting the majority of elderly Americans out of poverty. According to the Center on Budget and Policy Priorities, in 2012, only 9.1 percent of Americans over age 65 had incomes that fell below the federal poverty line, but 44 percent would have been in poverty had it not been for Social Security benefits. In fact, one study found that the rate of poverty for those over age 65 dropped from 28.3 percent in 1967 to 11.6 percent in 2000 and that the change was largely, even entirely, attributable to increases in Social Security benefits. Despite this, the nonprofit women’s advocacy group Wider Opportunities for Women, or WOW, found that “more than half of all fully-retired, elder-only households are economically insecure.” This assessment defines economic security as having an income that covers necessary living expenses without “relying on public supports, loans or family gifts,” according to WOW. Even with the stabilizing effect of Social Security, Medicaid, and other programs, it is clear that many Americans—52 percent—are at risk of not being able to “maintain their pre-retirement standard of living in retirement” after age 65. These facts give rise to questions about how best to encourage Americans to save for old age and the associated care costs for which they will be responsible, as well as about Social Security’s ability to maintain benefits as increasing numbers of older Americans retire. Currently, 6.7 million Americans over age 65 require long-term care, services, and supports—assistance with daily tasks to maintain a good quality of life despite cognitive or physical disabilities. That number is set to double by 2050 for all Americans who need long-term care services. While for some this might not mean round-the-clock care or assistance with day-to-day tasks, the 11 percent of people over age 65—5.1 million people, or one in nine older Americans—who suffer from Alzheimer’s disease, as well as others who face cognitive and dementia-related disorders, may require more intensive care. The number of those who need long-term care is expected to grow as more Baby Boomers retire. Long-term services and supports include paid and unpaid caregiving or a combination of both. Americans pay for long-term care supports and services in a variety of ways, including through incomes, assets, long-term care insurance, and Medicaid. Although Medicaid covers two-thirds of the cost of all paid long-term services and supports in the United States through federal and state programs, many Americans believe that Medicaid or private health insurance will pay for daily supports and services automatically for extended periods of time. It does not. Rather, individuals with assets must spend down their personal savings in order to qualify for Medicaid. There are also ways to estimate the costs of unpaid long-term supports and services. The Congressional Budget Office, or CBO, estimated that paid and unpaid long-term elder care supports and services cost Americans roughly $426 billion in 2011. Likewise, using an opportunity cost measurement based on unpaid caregivers’ for the elderly lost wages and data from 2011 and 2012, economist Amalavoyal Chari and others found that unpaid elder care cost $522 billion. The rising need for long-term and other kinds of elder care, as well as concerns about older Americans’ financial ability to support themselves and meet their care needs, illustrates the importance of facing these issues with a values-based mindset. This means acknowledging that meeting the needs of an aging population not only involves great financial concerns, but it also requires people to recognize the emotional and psychological aspects of care and aging. Lastly, in addressing the challenges ahead for the growing population of older Americans, real family values require the recognition that there are currently 3 million lesbian, gay, bisexual, and transgender, or LGBT, people over age 55, who often have particular legal, health, and care needs. Years of legal discrimination and social stigma mean that many LGBT seniors rely on families of choice and are more likely to live alone and be financially vulnerable in old age, as well as more concerned about disclosing their sexual orientation to their health care providers. Real family values compel us to fully appreciate caregiving, including its struggles and rewards. Unpaid caregivers, whether friends or family by blood or choice, care out of love and a sense of responsibility, and as such, their work should be recognized and valued. Unpaid care is sometimes a choice, but often it is also an economic necessity due to the high cost of and the lack of infrastructure surrounding paid care. Part of valuing unpaid elder care requires an understanding of the economic—as well as the physical and mental—stresses associated with it before one can address how policy can help support those who care. This is the case whether care involves organizing medication, paying bills, cooking dinner, shopping, dressing, bathing, transporting, or simply visiting an elderly family member or friend. 39.7 million Americans over the age of 15 reported providing unpaid elder care in 2012 and 2013, and 16 percent of those individuals were also employed. 76 percent of family caregivers reported providing day-to-day care with help only from their families. In other words, very few caregivers rely on significant help from paid care workers. 23 percent provided care on a daily basis. An older study found that 42 percent of employed Americans had provided care for an elder relative within the past five years. 57 percent of caregivers were women from 2012 to 2013. From 2012 to 2013, nearly one in five American women cared for someone over age 65. A 2010 report by the Families and Work Institute found that many unpaid caregivers for the elderly continued to work, and most reported not having enough time for other people in their lives, such as children and spouses, or even their own needs. Nearly half of the caregivers in the study were members of the so-called sandwich generation—meaning that they cared for both children and elders. The report, based on the National Study of the Changing Workforce 2008, or NSCW, described how elder care can affect families’ and unpaid caregivers’ work lives: 38 percent of caregivers took time off work in the previous year to care and, of those people, nearly half reported losing income. Most also wanted to reduce their working hours to provide better care, but only 23 percent did so. Those who earned less income felt the economic effects most strongly. Another study found that 21 percent of all caregivers—a number that can include those who care for elders as well as children and adults under 65 years old with long-term care needs—with annual household incomes under $50,000 found caregiving to be a significant financial burden. Interestingly, in the qualitative portion of the NSCW, caregivers for the elderly tended to rank their experiences as positive overall, though many felt guilty about the necessity of having to juggle caring and working, and as a result, many found it challenging to navigate their relationship with the person for whom they cared. This makes sense; family members care for elders out of love but also may not have another choice when paid care services are unaffordable. At the same time, there can be technical aspects of caregiving for which family members are not equipped—for example, administering medicines, giving medical care, or providing physical assistance such as helping someone get out of bed or use the bathroom. The emotional, financial, and time burden of caring for elderly loved ones can be stressful, but Americans meet these growing demands daily. To truly value the welfare of those who have cared for us, it is necessary to ensure that caregivers have the ability, opportunity, assistance, and guidance to care for themselves as well as their loved ones. Currently, a very small percentage of elderly people, about 3.5 percent in 2012, live in assisted living facilities, retirement communities, or nursing facilities. Moreover, in 2008, only one in four Americans reported that paid caregivers provided a “significant amount” of daily care. Still, the Congressional Budget Office predicts that by 2050, meeting the needs of America’s elders would require between 7 percent and 11 percent of the adult, nonelderly population to participate in paid or unpaid caregiving. One of the biggest concerns raised by the federal Commission on Long-Term Care’s 2013 report to Congress was that rapidly growing demand would result in a shortfall of elder care professionals. It said that attracting and retaining workers, from gerontologists to nursing home nurses to home health aides, would be a great challenge in the coming years. As demand for elder care professionals—including health professionals—grows, it is important to make sure that the working standards for the men and women who make up this workforce exemplify real family values, which means respecting the dignity and worth of this work and these workers. Today, 90 percent of home care aides are women; more than half of these are women of color. And wages are low for those who provide care professionally. In fact, the median wage for home health aides was $10.28 in 2014. Such wages fell below 200 percent of the federal poverty line for a single-person household in 2014. According to analysis from the Paraprofessional Healthcare Institute, 56 percent of home care aides rely on public assistance of some kind. This is not a perfect measurement, as home care aides include two job classifications—home health aides and personal care aides, according to the Bureau of Labor Statistics—and do not make up the entire elder care workforce. Moreover, home care aides may also care for nonelders with long-term care needs. Nevertheless, the numbers do provide some needed context. On September 17, 2013, the U.S. Department of Labor made a leap forward in supporting these workers. For nearly 40 years, under the Fair Labor Standards Act, home care aides were classified as “companions” and comparable to part-time babysitters—a designation that excluded them from minimum wage and overtime protections. In 2013, the Department of Labor ended this exemption. Although a Washington, D.C., district court struck down the move, the Department of Labor has appealed the decision and, as of this May, the case is still pending. The Department of Labor’s effort to reclassify home care aides was in line with values that Americans hold dear: fairness, just compensation, the value of work, and economic security. All of these values help make American families stronger. Home care aides provide a vital and growing service, and their work should be compensated accordingly. Furthermore, there are other workplace protections and benefits beyond wages. For example, the elder care workforce should have access to paid sick days and transportation allowances to travel between multiple clients. Protections such as these could help reduce turnover and make these jobs more attractive and viable for workers. It is possible to create good jobs that at the same time provide affordable care for families who face the economic stress of hiring care services, but it will require a commitment to transforming the nation’s care culture and infrastructure. All of the facts noted above show that there are many policy interventions that would help Americans better care for themselves and their loved ones as they age in a way that reflects real family values. There is a wide variety of economic policy interventions with different focuses and end goals that could improve the lives of elders, as well as those who provide paid or unpaid care. Creating programs to train family caregivers could help grow the paid elder care workforce. Another intervention, a piece of legislation proposed in 2014, would establish a Caregiving Corps that could provide short-term respite for caregivers. Furthermore, the federal government offers long-term care insurance to its employees, and promoting the uptake of this coverage could help start a larger conversation about long-term care planning. CAP also has proposed further reforms and tax credits related to long-term care insurance. Reauthorizing the Older Americans Act—first enacted in 1965—is another necessary action, and amending it to include provisions that help LGBT people gain access to the unique supports and services they may need would improve the act even more. Likewise, updating and strengthening Supplemental Security Income, or SSI, benefits could improve the lives of very low-income seniors. The Family and Medical Insurance Leave Act, or FAMILY Act, introduced by Sen. Kirsten Gillibrand (D-NY) and Rep. Rosa DeLauro (D-CT), is a clear example of a piece of legislation that could provide support to those caring for people across the age spectrum. The legislation would vastly increase access to paid family and medical leave for working Americans. While such leave is often associated with maternity or paternity leave, it also would provide caregivers the flexibility to take time off to care for aging loved ones suffering from severe illness. Similarly, the Healthy Families Act, introduced by Sen. Patty Murray (D-WA) and Rep. Rosa DeLauro (D-CT), would ensure that the approximately one in three Americans who do not have access to paid sick leave can earn up to seven days per year to deal with their own illness or that of a family member. Currently, only 13 percent of Americans have access to paid family leave, while just less than half of full-time workers report that they have the ability to change their hours; only 22 percent report the ability to change where they work. The lack of these basic flexibility arrangements puts an ever-growing strain on the ability of American workers to care for themselves and their families. Private businesses also can be part of the efforts to help employees that are caregivers by offering—as some employers already do—flexible work arrangements; referrals to services, supports, and care management consultations; and even adult daycare programs and other services. As of 2012, for example, media giant the CBS Corporation provides its employees with emergency in-home care for elder family members for $4 per hour. Likewise, Duke University and Johns Hopkins University provide educational workshops, consultations, and support groups for employees who need care services for family members. Within communities, grassroots solutions in the form of so-called villages—where largely, community volunteers and village members provide services that help seniors stay in their own homes—have gained popularity. The Village to Village Network has reported that the number of senior villages has more than doubled, from 50 in 2010 to 145 at the end of 2014. These grassroots membership organizations facilitate members caring for each other—whether it is changing light bulbs or arranging transportation—and, in some instances, have grown to include larger cultural programs and community events. While villages are not the solution to long-term care needs, they can be effective community tools for facilitating dignity in aging. In addition to all of these government, business, and grassroots ideas, communities of faith are in a unique position to help address current and future elder and elder care issues because they already often fill the spaces between financial and care needs by helping elders stay connected to community and providing support for them and their caregivers. Older people attend religious services at much higher rates than younger Americans and are more likely to say that religion plays a significant role in their lives. This is true for a diverse spectrum of older Americans. Studies throughout the past two decades have shown that elders who are part of faith communities report higher levels of psychological well-being. One survey found that 38 percent of LGBT people over age 50 attend a religious or spiritual service or activity at least once a month, while another found that just fewer than one in four transgender older people reported that people from their churches or faith groups were part of their support networks. Many people are familiar with religiously affiliated health care institutions and care facilities, but religious groups provide community services and supports in other ways too. Multiservice faith-based charitable organizations that work on a range of poverty issues often find an element of elder care that can be unexpected. Catholic Charities USA, for example, is made up of independent community agencies throughout the country. Some of these agencies have senior day centers, offer care coordinating services, or simply provide charitable funds in the form of rent or food assistance. 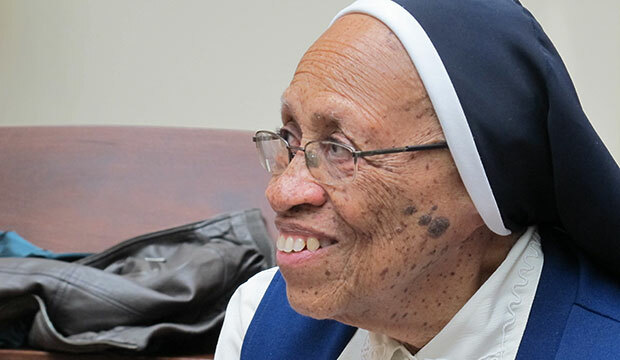 Seniors made up 16 percent of the people served by Catholic Charities in 2013, and in many communities, nonelder-specific services, such as immigration support, food banks, mental health, or substance abuse services can provide a lifeline for older Americans—both physically and psychologically. One interesting example of this cross-programmatic elder care can be seen in Boston, Massachusetts, and Nashville, Tennessee’s Catholic Charities affiliates, which regularly host special programs for Haitian and Bhutanese immigrant elders, respectively. Other religious communities are working to unite older Americans and the elder care workforce. Caring Across Generations is a nonreligious campaign that often works with communities of faith to improve both the quality and affordability of care, while making sure that paid caregiving jobs are good-quality careers. In its view, elder care challenges are growing, but a collective way of discussing and addressing these issues for elders, their families, and paid caregivers is missing. As such, Caring Across Generations is educating and engaging faith communities at the grassroots level and has facilitated some remarkable examples of activism. In New York City, for instance, The Eldercare Dialogues was a pilot program convened by the National Domestic Workers Alliance and Jews for Racial & Economic Justice. Three domestic worker organizations that represent diverse racial and ethnic groups—Adhikaar, Damayan Migrant Workers Association, and Domestic Workers United—and the congregants of B’nai Jeshurun, representing elders and their families, came together to discuss difficult situations and challenges relating to elder care. The dialogues engaged almost 700 elders, family members, and care workers between December 2012 and December 2014 and showed the interconnected nature of elder care issues across a broad range: immigration and gendered aspects of the elder care workforce; end-of-life needs; fair employment practices and caregiver agencies; and working with elders with cognitive disabilities. The dialogues’ participants also took part in activism and trainings for both potential care employers and caregivers. While the program was not explicitly religious, the values out of which the program grew aligned with the needs and values of many religious communities, including the congregation that housed the dialogues, and it is a model for other communities and congregations. Jim Kaufman, rabbi emeritus of Temple Beth Hillel in Los Angeles, California, has worked with national organizations, local advocates, and his congregation to educate and build a community committed to ethical and responsive caregiving. Partnering with the Pilipino Workers Center—a cooperative organization of largely immigrant, paid caregivers in the Los Angeles area—he formed a committee at his temple to work with the congregation’s elderly members and to inform them about how they could be responsible employers. Likewise, the committee members have partnered with local care workers to assist them in their fight for increased workplace protections and rights on state legislative action days and at rallies. Rabbi Kaufman, who has led Temple Beth Hillel for 40 years and watched many of his congregants reach advanced age, sees his work on elder care issues as both personal and universal. He says that as a clergyman, he wants to meet people where they are and sees both caregiving and care purchasing as huge issues in his community. In fact, Rabbi Kaufman has even called upon Jewish theology and scripture to highlight a religious basis for many aspects of paid caregiving issues, from job quality to support for care consumers and their families. In addition, theologians and religious professionals continue to expand frameworks for thinking about how Americans can face aging and caring for aging loved ones. The Journal of Religion, Spirituality & Aging often includes “practical innovation and scholarly insight” on the intersection of religion and aging. Furthermore, the Yale Divinity School’s special aging issue of its magazine Reflections focused on elder care in fall 2013 and included articles on retirement policy, theological discussions of death and aging, and first-person experiences with aging and caregiving. On a slightly more prosaic level, communities of aging ordained clergy—particularly Catholic nuns and priests—have been part of research on Alzheimer’s disease and other age-related cognitive diseases. Because members of these communities live together and have had similar life experiences, they are ideal candidates for such longitudinal research. Over the past nearly 30 years, these studies have helped researchers understand the progression of age-related cognitive diseases, as well as the risk factors, pathology, and biological processes involved. Taken together, all of the aforementioned policy, grassroots, research, and theological solutions highlight the many ways in which economic security is a fundamental expression of real family values. Communities of faith are uniquely positioned to incorporate these economic concerns into beliefs and values surrounding aging, the end of life, and caregiving. Moreover, there is great opportunity for policymakers, as well as paid and unpaid caregivers and elders themselves, to partner with religious communities to address elder care challenges effectively. Real family values are key to creating just policies and social structures surrounding elder care. The percentage of the American population over age 65 will increase dramatically in the coming years, and as such, it is urgent and necessary that America’s economic policies are fair and able to adequately prepare us for the road that lies just ahead. Caring for elderly family members—as well as ensuring the emotional, financial, and workplace stability of the family members and paid professionals who care for them—requires that dignity is paramount at any age and that doing just work, protecting the vulnerable, and embracing responsibility are valued. Emily Baxter is a Research Associate for the Economic Policy team at the Center for American Progress.